The author of this page will greatly appreciate comments, eyewitness accounts, historic documents and imagery related to the subject. Please contact Anatoly Zak. 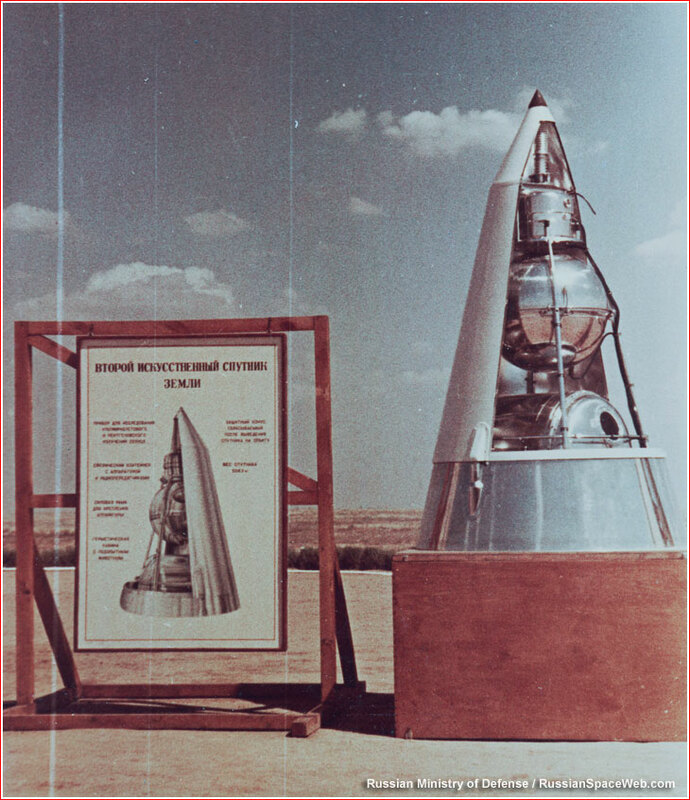 On Nov. 25, 1957, leaders of the Soviet rocket industry reported to the government that more than 70,000 signal acquisitions were received from the second satellite, radio contact information came from 1,900 amateur radio operators and 1,000 observations of the satellite had been made with optical means. According to the note No. SK-3/2586, 12 radio and telemetry stations received data on space radiation, shortwave emissions from the Sun, telemetry on the vital signs of the animal. A total of 150 downlink sessions were conducted with the spacecraft. In the course of the mission, specialists on the ground retrieved a variety of scientific and engineering data. During six orbits on the first day of the mission, and during the third orbit on the second day, ground control station received nine two- or three-minute telemetry fragments from the SP-65 solar sensor. Recovered data showed some increases and decreases in radiation levels, however, available pieces of the scientific puzzle, prevented Soviet scientists from building a complete picture of radiation belts surrounding the Earth. (248) It took the American Explorer I satellite few months later, to make this first major scientific discovery in the Space Age. When the Soviet establishment finally learned about Van Allen's belts (named after the author of the radiation experiment onboard Explorer I), some attempts were made to publicize "Vernov's belts" retrospectively, so named after a leading Soviet scientist in the field. The Sputnik-2 flight exemplified how science was propelled by Cold War politics -- a trend that would become of the Soviet and American space programs for decades to come. The news about the Soviet satellite carrying a dog was stunning enough to trigger an analysis by the US Central Intelligence Agency, CIA. 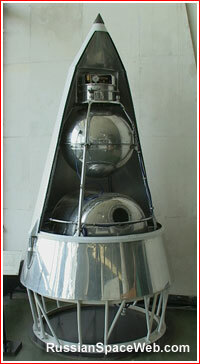 A resulting memorandum entitled "SPUTNIK II, With or Without Dog?" was issued on March 17, 1958. It stated that although "available evidence does not permit a positive determination that this satellite in fact did carry an animal," the agency officials "believe that SPUTNIK II did carry a live dog." 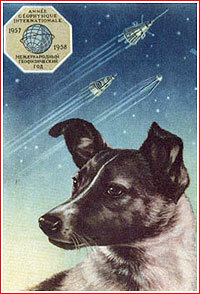 The document noted that "placing animals into space... is a necessary step to a manned space flight program..." Interestingly, the document seemed to quote a source inside the USSR, which in this case was not able to confirm or deny the Soviet claim, however the identity of the source was blocked out at the time the document was released in 2002, leaving it a mystery. Outside the Soviet police state and the clandestine world of Western intelligence, wide public was left to speculate about the details of the Laika's mission, as well as personalities and technology, which made it possible. One source correctly guessed that the rocket delivering Sputnik II probably used engines burning kerosene and liquid oxygen, while suggesting that "higher energy fuels were employed, containing either lithium or boron additives. (148) A number of other myths and confusions related to the Laika flight had circulated for decades and some had not been fully clarified at the time of this writing. Although advertised as another example of the superiority of the Soviet system, Laika's mission also brought a few unintended results. In the West, Sputnik-2 have sparked the debate over cruel treatment of animals. In the USSR, the mission was widely ridiculed in a cynical anti-government verse by anonymous author. As Golovanov wrote in his biography of Korolev, it was the happiest time for the leader of the Soviet space program. One can only imagine the excitement of a person whose dreams he cherished for decades started coming true in a matter of weeks, changing history and humanity in process. 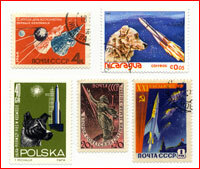 Laika and her mission onboard Sputnik-2 became a popular subject of postal stamps around the world. Click to enlarge. From Anatoly Zak's collection.